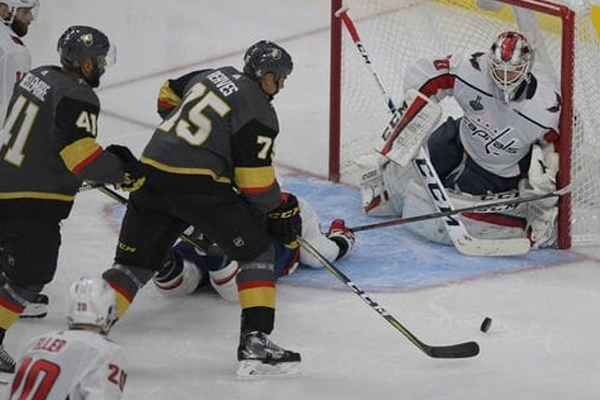 The Vegas Golden Knights won Game 1 of the 2018 Stanley Cup Final 6-4 over the Washington Capitals on Monday night at the T-Mobile Arena. The playoff pregame was a celebration of Vegas showmanship including archers, a trebuchet and a spectacular light show and then the Knights and Caps put on a high-energy production of their own with plenty of fireworks and drama. In a high scoring game Braden Holtby stopped 28 shots for the Capitals, but it wasn’t enough to stop the Knights. Tom Wilson put the Caps up 4-3 early in the third period when Fleury back-heeled a loose puck into his own net, but Reaves evened it 91 seconds later for Vegas. Nosek then put the Knights ahead before sealing the deal with an empty-netter. The two teams combined for 62 shots on goal, and the third period alone featured four goals. Entering the Stanley Cup Final, the Golden Knights ranked second in goals-against average and the Capitals were second in scoring. Vegas could be in trouble should the rest of the series continue to be a high-scoring affair. Game 2 is scheduled for Wednesday night at 8 p.m. ET in Las Vegas.